Android Version is in development and will be available soon! oneTODO works with your phone number so you don’t need to waste time on stuff like login and passwords and email confirmations. Install it and start organizing your life right away. You can customize the app as per your own specific needs to increase productivity and to save time. Sort your to-dos by time like today, tomorrow or upcoming as well as sort them by category like home, office or personal as per need. 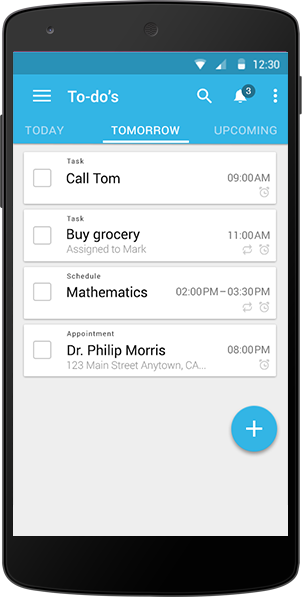 Filter your to-dos for tasks, events, schedules and appointment with a single tap. oneTODO offers you a beautiful and highly productive one-calendar to keep track of all your ongoing and upcoming events. You can import your Google calendar or iCal to keep your all events at one place. What, where and when is something happening and who is invited. Keep track of your all sent or received event invitation within your one-calendar. You are a small group or a part of a big team, working on a single project or sharing multi projects. OneTODO helps you to manage all at one place without missing a single deadline. Start collaboration right after starting app. oneTODO automatically scan your phonebook to find your colleagues who are also using oneTODO or simply invite them. Starts project, invite your team, make and assign tasks, add attachments from almost anywhere. Discuss progress with all team or a single team member and many more, all within oneTODO. OnetoDo offers more useful features than any other to-do list. So you can do more to customize the experience, organize your tasks and projects, and optimize your productivity. Add tasks and never miss anything again. Plan your events and keep your all events at one place. Keep track of your schedules and never miss any lecture. Set your appointments and keep them separate to not miss them in your busy routine. Either use oneTODO to manage just daily routine or a big project. Customize accordingly. For quick view, filter your to-dos for tasks, events, appointments or schedule. Get reminded by email or by push notification. Location based reminders included. You do something often. Do it once and set repeat. Add notes in your tasks or projects to add more details. Add attachment from camera or gallery to boost up productivity. Send or receive invitations for events and keep all invitations at one place. Start and manage your projects and everything about it with tip of your finger. Invite your team and assign different tasks to team members. Discuss your projects with your team or with individual team member.